The owners of this new Custom Farmhouse have kept its design classic for a timeless feel. The large open concept Kitchen is MDF painted in ‘Silver Lining’ with a ‘Charcoal Glaze’ and Raised Panel Doors with ‘Rustic Pewter’ Handles, Knobs and Pulls. Granite is seen gleaming throughout the kitchen perimeter in 3cm ‘Black Pearl’, giving weight and balance to the white kitchen cabinets. Tucked away in a nook is a Built-in Oven with drawer below and Glass Framed Upper Cabinets with Interior and Under Cabinet Lighting has country kitchen written all over it. Traditional in every sense of the word is the stunningly crafted Custom Made Heritage Hood, which has the ability to do double duty by venting air and show off beautiful displays on the shelf above. A lattice work style Wine rack uses up the dead space above the fridge providing a place to store wine. Adjacent to the fridge is an Upper Cabinet with Glass Framed Mullion Doors that display colourful glassware and underneath is an Open Shelf with a V-Groove Cabinet Back displaying coloured glasses in the kitchen’s accent colours. Glassware in the owner’s accent colours creates visual interest on the Custom Open Storage Shelf between kitchen and dining room. Contrast between the Glossy Farmhouse sink and the Sink Cabinet is made evident by the Maple Painted cabinet in ‘Spanish Olive’ with ‘Charcoal Glaze’, Mitre Framed Doors with the design interest of Inset Rope Moulding and Crystal Knobs. Custom Rope Posts mimic the inset rope moulding bringing fluidity to the design concept. 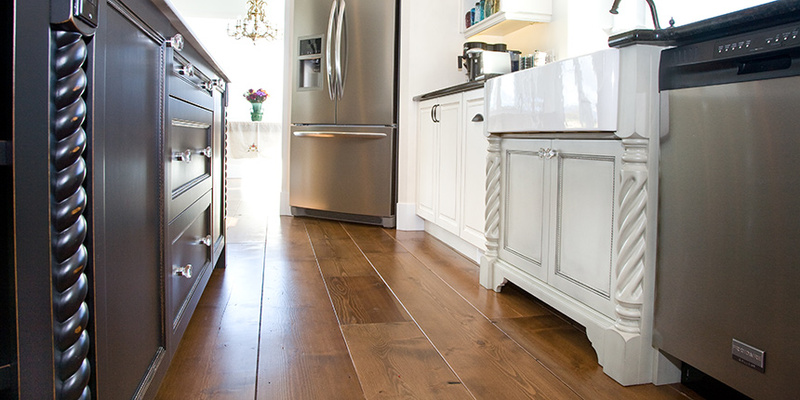 The Furniture Kick on the base of the cabinet brings character to the custom home. Dominating the open space of this room is the Island that has a Vintage Farmhouse feel. The Maple Painted Island is Stained in ‘Black Lacquer’ with Country Pine Stained Distressed Mitre Framed Doors with Inset Rope Moulding and Crystal Knobs. Featured on this colossal piece is a Custom Furniture Kick and Curved V-Groove Paneled Bar Back with Custom Corbels. Custom rope posts show quality craftsmanship and design. Showcasing desirable pieces on the Open Finished Interior Angled Cabinets is aesthetically pleasing and a great way to store regularly used items. 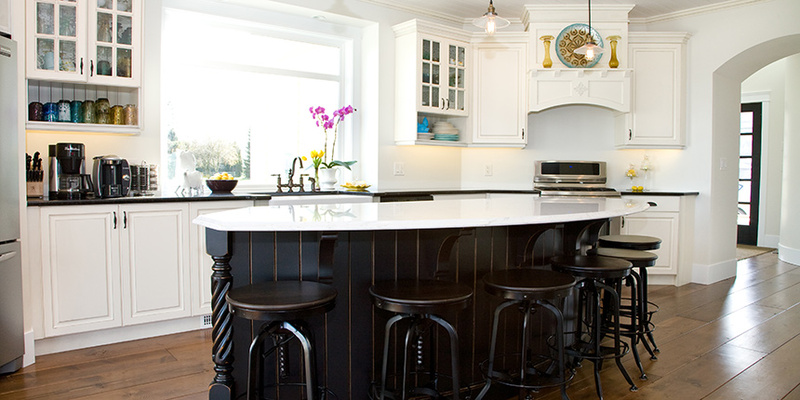 Opposites attract for the countertop design scheme, the Island features a 3cm Cambria Quartz Countertop in ‘Torquay’ with an Ogee Edge Profile that lightens up the delightfully dark Island, contrasting with the perimeter cabinets. It is not hard to imagine the family perched on the barstools waiting for goodies to finish baking or doing homework while dinner is being made. A cheerfully masculine design that can easily age with boys is shown in the boys’ bathroom. 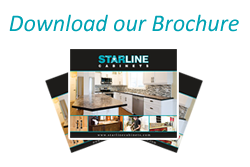 The cabinets are outfitted with ‘Black PVC Wood Grain’ Slab Vinyl Wrap Doors and ‘Brushed Nickel’ Handles. 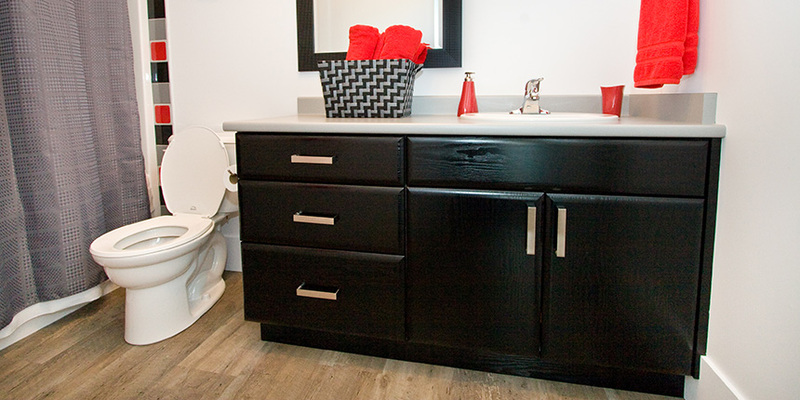 Red, black and grey accents are pulled throughout the room including the Laminate Covetop Countertop in the colour named ‘Negotiating in Geneva’, the mirror, red towels, clock above the toilet and eye catching tile work around the exterior of the tub. Pretty in Pink! There is no mistake that this is a Girls bathroom. Pink is splashed across this room from paint to towels to the shower curtain. Warming up the room and keeping the room from becoming too bright, is a Laminate Covetop Counter top in ‘Earthen Warp’. 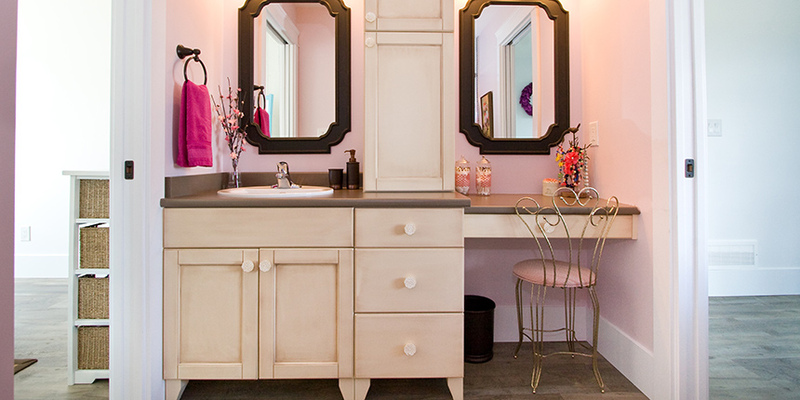 This Vanity is so classy, it is even has a Make-Up Desk to finish getting ready at while another girl uses the sink. Storage abounds with the On Counter Cabinet, triple Pull out Drawers and under sink Cabinets. Ultra feminine cabinets built with Pro-V Shaker Doors in a Slab Drawer Front style are Painted MDF in ‘Vanilla’ with an ‘American Walnut’ Glaze, along with the Custom Furniture Legs. To top it off, the Slab Drawer and cabinet fronts are adorned with ‘White Porcelain Flower’ Knobs. Double occupancy demands his and her sinks. Keeping the Farmhouse feel are Painted MDF ‘White Satin’ Shaker V-Grooved Panel Doors with ‘Pewter Handles’. 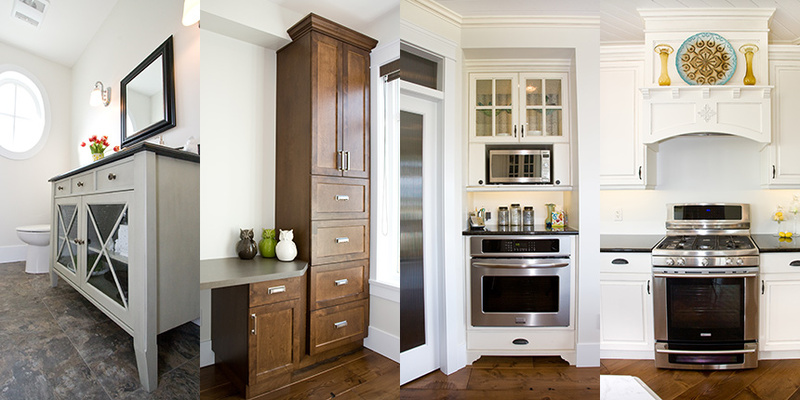 Dividing spaces and hiding clutter is the On Countertop Cabinet with Custom Light Boxes to illuminate each zone. 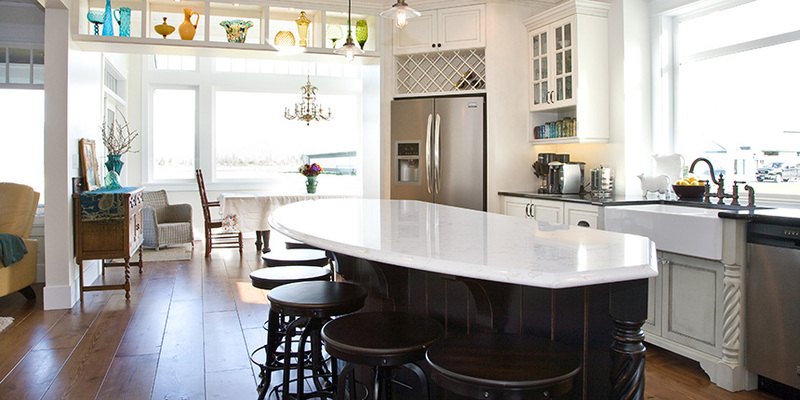 An elegant Laminate Covetop Countertop in ‘Jeweled Ivory’ highlights the pristine cabinets. Light, bright and white! We are enamoured with this vanity that is brought to lofty heights because of the Custom Furniture Legs that keeps the Powder Room from feeling weighed down. A 3cm Granite Countertop in ‘Cambrian Black’ with an Ogee Edge perfectly balances the Maple Painted ‘Spanish Olive’ Vanity with a ‘Light Charcoal Glaze’. Showcasing the towels behind the Custom Criss Cross Glass Frame Doors with Slab Drawer Fronts and Decorative ‘Brushed Nickel Knobs’ shows what simplicity and elegance a farmhouse style has. Dominating this crisp and clean Laundry Room are the red washer and dryer that sit below a Laminate Covetop Countertop in ‘Tatami Mat’. Storage space is endless in these upper and lower Country style cabinets made from MDF Painted ‘Vanilla’ Slab Large V-Groove Doors with ‘Oil Rubbed Bronze’ Handles. 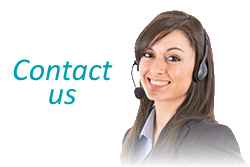 It is essential for a family of this size to be organized and efficient. 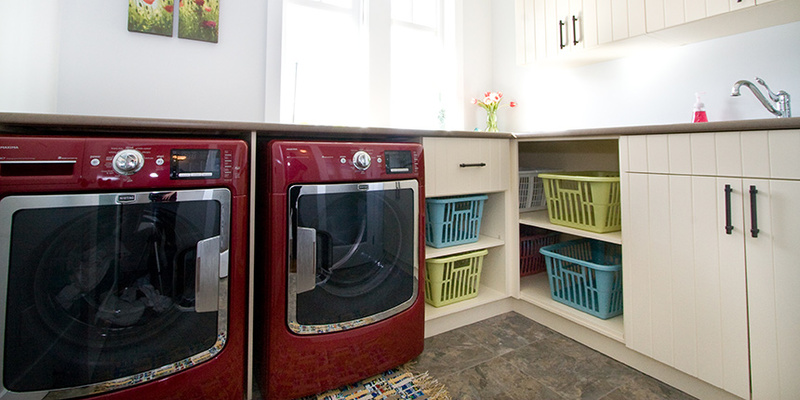 There is even ample space provided Open Front lower cabinets for up to six laundry baskets. Office space is a must in any home and here we find continuity in the colour palette, from the floor stain to the Birch stained ‘American Walnut’ Shaker Flat-Panel Doors with Slab Drawer Fronts and ‘Stainless Steel’ Handles and Pulls. Creating textural difference is the Laminate Countertop with a Flat Edge, Curved and Clipped Corners in ‘Passing Through’. This small home office is a visual delight that gives the impression of a custom design filing cabinet and desk combination. 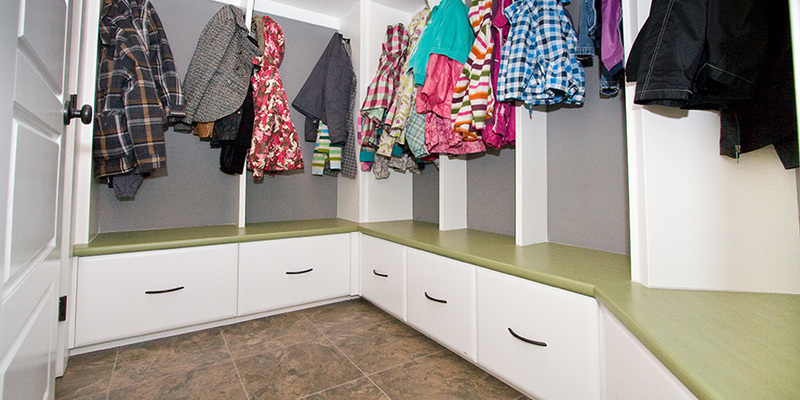 Clutter free and full of storage is exactly what is accomplished in this Mud Room. Lower cabinets with loads of hidden storage are made from White textured PVC Slab Vinyl Wrap Doors with Black Handles. Above we find Open Shelving Cabinets doing double duty as they provide visual appeal with fun storage boxes and extra storage for rarely used items. The Laminate Covetop bench in ‘Tatami Wasabi’ is great place to perch while putting coats and shoes on and an easy clean for a home this busy.